For over 50 years, Ben Silver has manufactured jewelry quality blazer buttons for many prestigious clubs and corporations, in addition to the hundreds of universities and prep schools we serve. Our longstanding reputation resulted in our commission to produce 350,000 sets of blazer buttons as commemorative gifts for the 1980 Ronald Reagan Presidential Inaugural; and we have made U.S. Presidential Seal blazer buttons for every occupant of the Oval Office since Harry S. Truman. 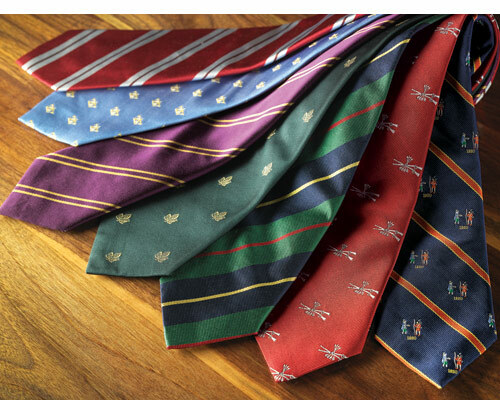 For nearly three decades, we have been recognized as the leading manufacturer in the world of pure silk authentic British striped and crested handsewn neckwear, and we have produced “club” stripes and crests for many of the world's foremost private clubs and corporations. Beyond blazer buttons and traditional neckwear, the Ben Silver name is identified with quality and classic style among aficionados of traditional, elegant and tasteful clothing. The name Ben Silver meets with recognition in the highest echelons of American business. Our custom clients know that their membership recognizes Ben Silver for the quality and craftsmanship they expect in their apparel. Our clients draw on our design and production capabilities, while enjoying our company's heralded service. Bring us your logo, seal, colors, or any aspect of your graphic identity, and allow us to show you how we can satisfy your development or corporate needs with a product your membership will be proud to wear. 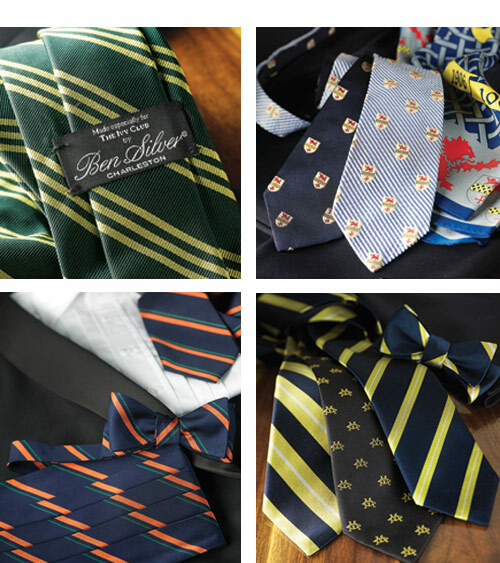 A Ben Silver tie will be worn proudly, not hidden in the closet to gather dust. This is because each tie is entirely hand made of the finest pure English silk as befits the importance of your affiliations. Vibrancy of color and the “hand” of the silk are both unique to Ben Silver cloth. Our cutter cuts and makes the ties the old-fashioned way: by hand and slip-stitched. Once we have created the very finest silk handmade neckwear for your organization, you will enjoy seeing your colors in other accessories such as bow ties or formal wear sets cut from the same silk! Our newest printed silk scarves also provide women with a way to show their colors with pride. We will hand engrave dies of unparalleled accuracy in order to stamp blazer buttons in the metal of your choice, including 24kt gold plate over brass, 14kt gold filled, Sterling silver or 14kt gold. The same die used to produce the blazer buttons can also be used to strike cufflinks, tie tacks, lapel pins or formal wear sets with matching studs. Color, where desired, is achieved by the art of cloisonné – a process in which finely ground colored glass is applied between metal wires one color at a time and then individually fired to ensure fidelity. Then the jewelry is either polished or plated, depending upon the metal, to assure its ability to survive the drycleaning process. 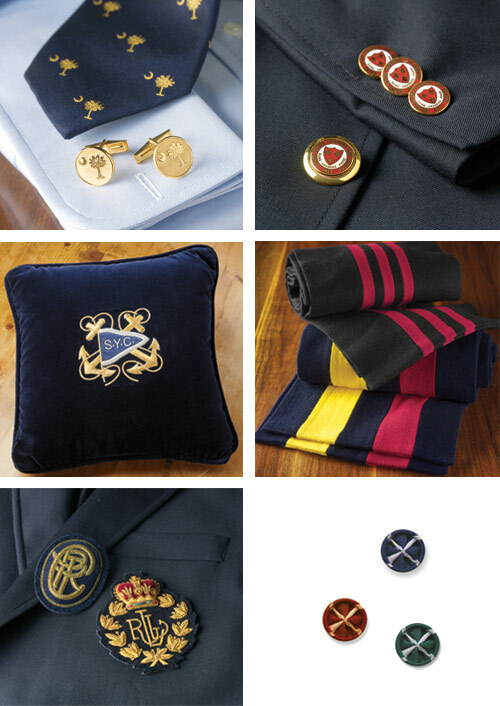 Our blazer badges are handsewn with 24kt gold plate bullion thread and are true to the minute details of your motif. Our 16" square velvet pillows, bountifully stuffed with down feathers, are hand embroidered on black or midnight blue with 24kt gold plate bullion wire thread, to reproduce your club design authentically, in flawless detail. Lapel rosettes are hand crafted to order, using fine quality fabric pleated to resemble a rose, in colors chosen to identify the organization or award it represents.